Whether you represent a company, brand, or work as a freelancer, video editing plays a major part in making a video content ready for consumption. Unedited or uncropped videos that need to go live in a quick turnaround time can become a point of concern. If you have been on the fence about outsourcing video cropping services to remove unneeded information from video clips, now is the perfect time to summon the help of professional video editing company like ours. Outsource2india can make your videos look sharp by removing vertical pillar boxes or other details that come in the way of immersive experience. We can also crop video clips to a square and alter the aspect ratio to fit your needs. Working with videos in multiple formats without stretching your budget is something we excel at. How Do You Crop A Video? Cropping a video takes skill and time to accomplish flawless results. A plethora of video editing tools (free and paid versions) on the world wide web are marketed by companies that follow standard steps - decode, crop, and re-encode. However, they may not match the precision of a manual video editing done by professionals with many years of experience, but if you still want to make do with a budget alternative then it serves the purpose. On the contrary, if you are looking for a tastefully done video editing to achieve commercial success then collaborating with a professional video editing services company like O2I is the best choice. Editing videos with a touch of creativity can go a long way to emotionally connect with viewers. To crop videos with precision, it is important to know its limitations. This key information will enable editors to avoid cropping videos to an extent where quality becomes the casualty. Information such as pixel density, aspect ratio, constant rate factor, and resolution is critical for video cropping performance. In the video cropping process, corners of the cropping rectangle are dragged to the desired size by considering the frame rate, bit rate, and constant rate factor. If these three factors align between the input and output files, then cropping can be achieved in a lossless manner. What is Included in the Video Cropping Services Offered by O2I? It's a matter of fact that automated tools which detect and eliminate black bars lack the precision when compared to manual removal of unwanted details. When the encode setting of the cropped video is out of spec with the original file then the results will fall outside the acceptance criteria. Therefore, manual cropping is more successful in producing desired results because with skill and accuracy we can preserve the quality of pixels, resolution, and aspect ratio in the finished video. In the manual method, once you upload the video, we will use proprietary video cropping tools to select frames of interest and find the "x" and "y" offset for cropping rectangle with the cursor position. In the last step, we customize coding preset for the target video. By using a combination of masterful techniques, we can crop your videos and save the finalized output in any format of your choice. What are the Constraints to Video Cropping Services Offered by Us? How Do I Crop a Video in Windows? Cropping a video on Windows operating system is relatively easy if you are working on simple video projects that do not require the degree of perfection sought after in the commercial arena. To begin with, a video editing suite or a simple program compatible with the Windows operating system must be installed on a Windows machine. Depending on the software feature you may have an option to work on a nifty dash console, or a simplified timeline with buttons to choose a point in the video clip. By marking coordinates, you can select the cut-in and cut-out points to perform move or trim functions. Finally, by using a transporter or container codec you can export the clip in any format of your choice. What is the Process Follow by Outsource2india for Video Cropping? Why Choose O2I for Video Cropping Services? We are an ISO 9001:2015 certified company that is quickly surging ahead to become a top provider of video cropping services in India. We have satisfied many clients with different spending capacity and purposes. Our commitment to project and data confidentiality is unwavering. Today we are proud to possess ISO/IEC 27001:2013 certification for adhering to strict security policies and protecting your digital data from external or internal elements. Furthermore, only professionals who are signatories of non-disclosure agreement are permitted to handle the video cropping project. Accuracy is the cornerstone to success in video editing. To achieve perfection in video cropping we walk the extra mile and bring you polished results that are approved by our quality control specialists. You will be impressed with our skills in turning your video into a commercial success. Speed is another key element in capturing the market. If you want a swifter option to market videos we have you covered. Our editing teams are attuned to working under a tight deadline. We can crop your videos without the quality reduction in a quick TAT. You may have stand-alone or multivolume video cropping requirements, no matter what we are ready to handle your scalable demands without stretching the budget or timeline. Experience scalable performance when you partner with professional video editors like us. Cost is a concern in creative service because most manual video editing companies do not shy away from charging an exorbitant amount. If this is your concern, fret not! We offer a flexibly priced video cropping services that would let you choose what is best for your budget size and purpose. We can assign a dedicated representative who will liaise with the editing team to bring you real-time updates on the project. Should you feel the need to contact us for more queries and cost-related concerns our point man will guide you in a personalized manner. Only at O2I you will find skilled video editing team who can crop, trim, enhance, and do so much more of editing functions with confidence because our team possesses over a decade of experience in helping clients to showcase their videos with freshness. 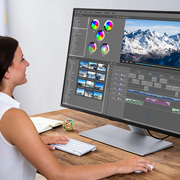 Since creative tasks like videos editing require the latest hardware and software support we are constantly innovating to include more recent inventories to our infrastructure for superior editing performance. We also optimize our security systems (physical and digital) to keep your project safe from outside interference. AI and ML integrated software we use for the editing projects are obtained from reputed publishers who provide timely updates and support. By using standard and proprietary editing tools we are committed to offering unparalleled quality in video cropping services. You can share videos with us via a secure FTP and VPN that facilitates movement of large-sized data without risk and other constraints. We routinely run maintenance checks on our secure data sharing channels to keep channels free from malicious elements. Our global contact centers remain operational 24X7X365 basis to extend timely support without time zone restrictions coming in the way. We can be contacted by email, phone call, or web chat from your local region for a quick response. O2I helped an Ontario wedding film company with wedding video editing services. The service helped the company save time, money, and effort. Video Cropping from Outsource2india is sought after for enhancing the quality of video clips irrespective of the project size and complexity. Our services can be availed for commercial and non-commercial purposes because we complete the process with professionalism and skill. Being a leader in creative design solutions for 20 years we continue to give our competitors the run for their money. If you want reliable video cropping services straight from our editing specialists at an affordable rate, then it's best to outsource video cropping services to O2I. We are an ISO certified company that can offer you value for your investment with high-quality service. We also offer other services such as design services, illustration services, logo design services, artwork services, and more. Contact us and out outsource video cropping services if you are looking for smart ways to save cost and time without loss of quality.